Seagate has announced its Pulsar solid state drive (SSD) for blade and other format servers, saying it is only the first of several enterprise SSD products. Pulsar is a 2.5-inch form factor product using single level cell (SLC) flash and fitting in a standard 2.5-inch drive bay with its 7mm z-height. The drive has a 3Gbit/s SATA II interface and 50GB, 100GB and 200GB capacity points. There is a DRAM cache and its contents are preserved if power is lost, unique in this class of device, according to Seagate. There is a 0.44 per cent annual failure rate for Pulsar and Seagate provides a 5-year warranty that it will function and perform as specified - reassuring for OEMs worried about write performance dropping off. Peak read and write IOPS with 4KB blocks are 30,000 and 25,000 respectively. The Sustained read figures are 30,000, but the sustained write numbers are 10,500 (200GB product), 5,300 (100GB product), and 2,600 (50GB product). The company is not willing to discuss the sourcing of the NAND chips used or the sourcing of any aspect of the controller technology. Rich Vignes, a senior product line manager, said: "There are lots of Seagate engineers working on controller technology." Why was the SATA 3Gbit/s interface used and not, say, 6Gbit/s SAS or PCIe? Teresa Worth, a Seagate senior product marketing manager, said that SATA II was requested by the OEMs because server motherboard chipsets came with it and they didn't want to support additional interfaces because their costs would go up. She said the chipsets would evolve to support SAS directly. Worth said Pulsar is both the name of Seagate's SSD product family and the name of the first product in the family. She said Seagate sees four enterprise solid state storage markets. Two are for high-end and mid-range external (networked) storage arrays, such as EMC's Symmetrix at the high-end and Clariion in the mid-range. The third is for servers with direct-attached storage and entry-level RAID controllers. Worth's slide deck mentioned LSI MegaRAID and HP MSA at this point. The fourth market segment, into which Pulsar is targeted, is for servers again, but in blade format or general application servers. 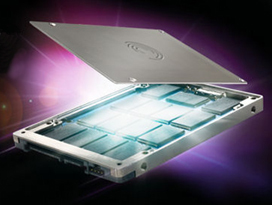 Here SSDs provide performance at low electrical power levels and "enables lower power, denser" server products. Worth said Seagate will have SSD product in all four segments. She asserted: "[Pulsar is a] rock-solid enterprise drive from Seagate. No-one knows enterprise storage like we do." The backstory is that Seagate is a late entrant to the enterprise SSD market, with STEC having more or less sewn up the enterprise storage array sector with its Fibre Channel-interface ZeusIOPS product, and with Intel in second place with its X25 product. The SAS form factor looks to gradually become the main interface here moving forward. Western Digital has an SSD entry that comes from a government and military market and which is intended to move into the enterprise SSD space in the future. Texas Memory Systems has a commanding presence in the external solid state storage market, in which a solid state array replaces a hard drive array for applications such as in-memory databases. In servers, Samsung, Fusion-io, Intel and STEC are all making progress with SATA II and PCIe being the interconnects preferred. Micron also intends to enter this market with a PCIe-connected product. There are several start-ups looking to focus on the enterprise market, including Pliant, Violin Memory and SandForce, with its controller-only technology. The key thing here is that there are relatively few but enormously powerful large OEM suppliers. In servers we're looking at Dell, HP, IBM and Sun, with Acer a recent entrant and several minor players. In the storage array area there are more OEMs, such as the big six: EMC; Dell; Hitachi Data Systems; HP; IBM; and NetApp, plus 3PAR, Compellent, Fujitsu, Pillar, Sun, Xiotech and others. It's vital for Seagate to gain qualification and supply agreements for its drives from these server and storage players. Seagate is relying on its existing OEM hard disk drive relationships to open doors for its Pulsar SSDs and Worth says it has been shipping Pulsar on a revenue basis to OEMs since September. That does not mean that any of these OEMs are supplying product to end-users containing Pulsar storage, though. Vignes said Pulsar's performance compares very favourably with STEC and also with Intel's SSD products, which he expects to see in the blade and general application server space.